A woman has been shamed for drinking caffeine during pregnancy. One of the best things about being pregnant is other people’s opinions; said no pregnant woman ever. And especially not one expectant woman who was ‘coffee-shamed’ recently. “Me – It’s one cup, it’s fine. “GM – NO YOU CAN’T HAVE IT YOU’RE NOT ALLOWED (takes cup from my hand and drops it, full, into the trash next to the counter). “Me – You cannot be serious. It’s fine. My doctor even says it’s fine. (I looked at the barista, who is just standing there, mouth agape. She lets me know she’ll make me another). “Me, to GM – Please leave me alone. I’m tired, and want my coffee. I get one cup a day, this is it. Please go away. “GM, NO YOU CAN’T HAVE IT YOU’RE PREGNANT IT WILL MAKE YOU HAVE THE BABY NOW. “Barista hands me my cup directly, and this insane woman GOES TO TAKE IT FROM ME AGAIN. And with that, the confrontation, finally, mercifully, came to an end. 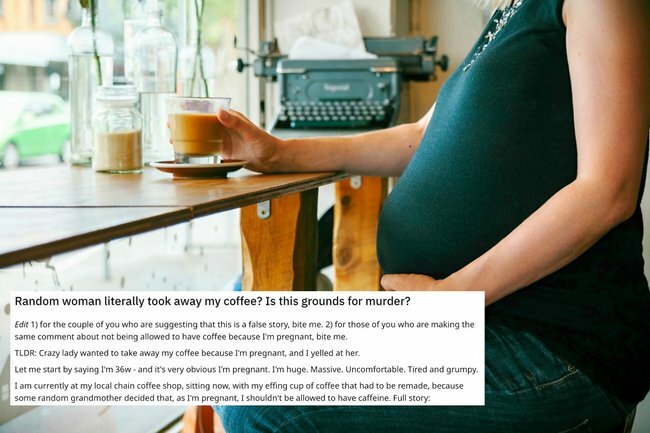 Commenters on the Reddit thread were furious at the outrageous coffee-shaming incident, especially those who’d experienced similar pregnancy-related judgements. Another added, “A series of short films about the nonsense pregnant women have to go through would be AMAZING. Of course, there was a discussion on how safe caffeine is during pregnancy, with most siding with the woman, agreeing it was entirely her choice. “I am FURIOUS for you,” one woman wrote. The update the woman later posted to the Reddit thread. Source: Reddit. And that&apos;s the point the &apos;grandma&apos; seemed to miss: her body, her choices. "One: for the couple of you suggesting that this is a false story, bite me. "Two: for those of you who are making the same comment about n0t being allowed to have coffee because I&apos;m pregnant, bite me." We couldn&apos;t have said it better ourselves. Have you ever been shamed during pregnancy? Tell us about your experience in the comments section below.